All SANDSTONE COVE homes currently listed for sale in Park City as of 04/25/2019 are shown below. You can change the search criteria at any time by pressing the 'Change Search' button below. "Located in the exclusive neighborhood of Sandstone Cove, this spectacular estate sits on a premier property atop Park Meadows with 270 degree views of the mountains and ski resorts. The long, gated and tree-lined driveway creates an elegant approach to this stately residence, with heated motor court and 4-car garage. Beamed, vaulted ceilings and bold stone archways create a grand yet cozy interior ambiance, and the picture windows frame the views from every angle. Entertain friends in the great room while listening to the player piano or enjoy quiet, family time in the hearth room with wood-burning fireplace. Downstairs is the family room with wet bar, game room, temperature controlled wine cellar and large workout room. There are outdoor living spaces on every level, with a hot tub outside the master suite and wood burning fireplace outside the family room, a private elevator, radiant heat throughout, and air conditioning. 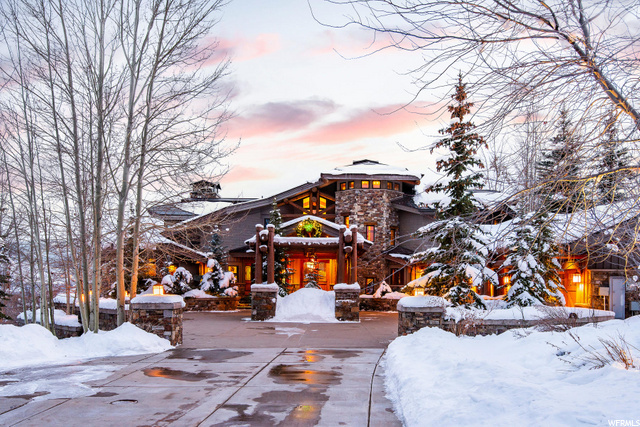 This is a one-of-a-kind legacy property in the heart of Park City." "This stunning contemporary home is located on 6+ gated acres. The long tree-lined driveway ends at a 2000 square foot heated motor court that abuts a 3 car oversized heated garage with a workbench and substantial cabineted storage space. On entering the elegant structure one is met by a soaring floor-to-ceiling curved window wall that frames a 180 degree view of the ski resorts by day and the town lights at night. A similar view can be experienced from most other rooms in the house. Fine finishes and exceptional craftsmanship complement the open floor plan. The rich American Cherry floors, copper accent and beamed ceiling, fireplace, indoor/outdoor Sonos audio system, decks and extensive outdoor lighting set the mood for any occasion. A fully configured eat-in chef's kitchen features Viking and Sub Zero appliances, 2 sinks, 2 dishwashers and a large walk-in pantry. Adjacent is a formal dining room that affords a serene entertainment environment. The house features five en suite bedrooms and a powder room. These include a private sanctuary master suite with exceptional views, a balcony, fireplace, spa-like bath and oversized his and her walk-in closets; and a fully contained guest quarter with its own entrance and full kitchen and living areas. In addition to the bedrooms there is a large home office, a theater room, workout room, wine room and a sizable laundry room. The thoughtful floor plan of this multigenerational home provides ease of daily living and entertaining. "